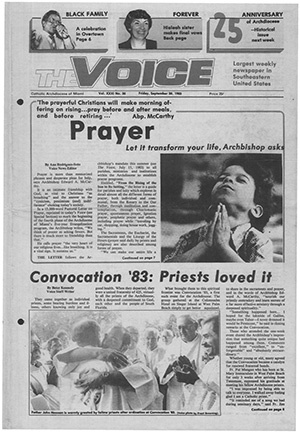 More than 7,500 people attend the blessing and dedication of St. John Vianney Seminary in Miami. A year later, the diocese announces that “212 young men (are) studying to become priests of the Diocese of Miami,” and 130 of them are enrolled at St. John Vianney. Bishop Coleman Carroll announces the creation of Centro Hispano Catolico, with offices on three floors and the basement of Gesu School in downtown Miami. The center will provide religious instruction, information and guidance, English classes, child care, health and medical services and more for newly arriving Spanish-speaking immigrants. Its purpose, in the words of its director, Father Hugh Flynn, “will be to welcome these people, to enable them to get acquainted with others and to encourage them to become active members of the parishes in which they will live” as well as enroll their children in Catholic schools. 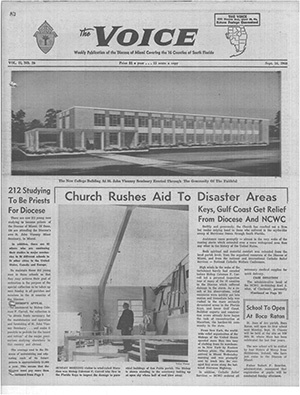 Hurricane Donna sweeps through the Florida Keys and Gulf Coast and Bishop Carroll flies through the diocese to inspect the damage, which includes half of the roof blown away at San Pablo Parish in Tavernier. The diocese begins construction of a major seminary, St. Vincent de Paul, in Boynton Beach. 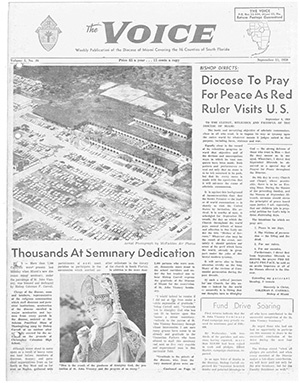 Archbishop Edward A. McCarthy arrives in Miami following his appointment by Pope Paul VI as Coadjutor Archbishop with right of succession to Archbishop Carroll. Archbishop McCarthy calls a historic “conclave of priests” — now an annual convocation — to be held on Singer Island in West Palm Beach. 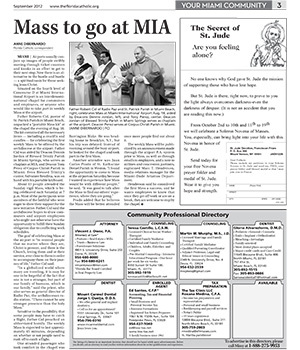 This is meant to be a time of spiritual renewal for clergy, whose parish duties during their absence are assumed by visiting and retired priests. 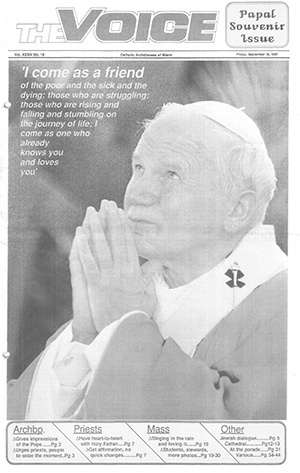 Sept. 10-11: The future St. John Paul II begins a 10-day tour of the U.S. with a stop in Miami. 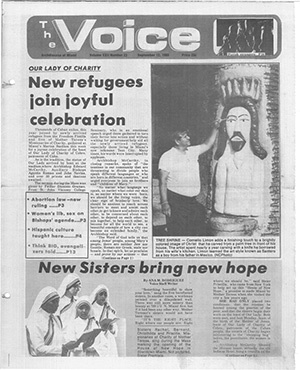 His visit includes prayer with priests, religious and laity at St. Mary Cathedral, followed by a brief greeting in Creole to the Haitian community gathered outside; a meeting with priests at St. Martha Church and a greeting for Pastoral Center employees afterward; a meeting with President Ronald Reagan at Vizcaya; a historic meeting with Jewish leaders in downtown Miami; and an “unfinished Mass” with nearly a quarter of a million people at Tamiami Park — rain and lightning forced the pope to finish the Mass inside a trailer behind the main altar. More than 12,000 people gather at the Miami Arena for the episcopal ordination of Bishops Gilberto Fernandez and Thomas Wenski. The moving, two-and-a-half-hour ceremony highlights the multicultural diversity of the archdiocese, as Gregorian chants combined with Haitian rhythms, Spanish hymns, and prayers in Latin, English and Spanish. Among those present for the ceremony were all the bishops of Florida; four bishops from Cuba; two bishops from Haiti; and one bishop from Nigeria. Despite a drenching downpour, about 700 people attend the groundbreaking ceremony for the new Archbishop Coleman Carroll High School in southwestern Dade, the first Catholic high school to open in the county since 1975. The groundbreaking had been delayed for months by zoning problems. 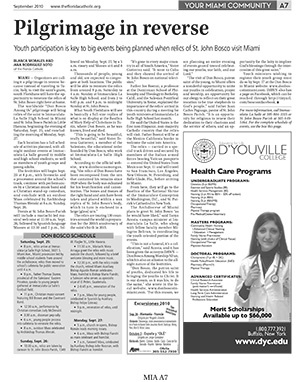 The worldwide “Don Bosco Among Us” pilgrimage stops at Miami’s Immaculata-LaSalle High School and St. John Bosco Church, giving South Floridians an opportunity to venerate the saint’s relics. 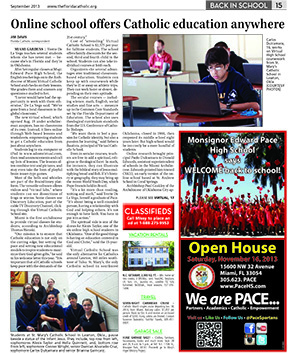 At Immaculata-LaSalle, the celebration is aimed at teenagers, and includes fireworks, a candlelight procession around the school’s track and performances by a Christian band and Christian stand-up comedian. 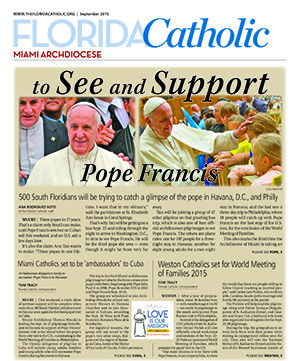 500 South Floridians board planes and buses as the archdiocese organizes three pilgrimages for the visit of Pope Francis to Cuba and the U.S.: 47 will go on an overnight bus ride to see him in Washington, D.C.; 187 will board to two planes for a three-night stay in Havana, Cuba; and dozens more will drive or fly to Philadelphia to take part in the World Meeting of Families and greet the pope at his last stop in the U.S. 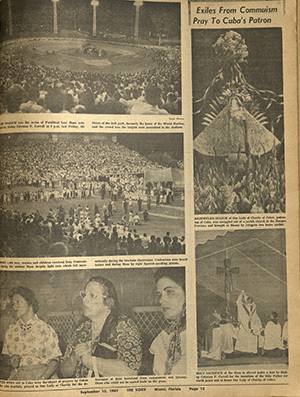 Enjoy reading the memory lane of the 60 years anniversary. Correction San Pablo is in Marathon not Tavernier. Marathon and Key Colony were devastated by hurricane Donna. My husband's family lived in Marathon at the time and the place looked like a war zone.